The much-awaited D25 (actor Dhanush's 25th film) Velai Illa Pattathari released its trailer last night. High expectations surround this film directed by Velraj, produced by Dhanush and to be released by Escape Artists Motion Pictures. VIP also has director Samuthirakani and Saranya Ponvannan playing important roles. The trailer starts off with Dhanush saying - "Interview la vandhu paarungha, naalu varthai sendha madhiri English pesa evalo kashtapadrenu. Vela kadaikale vela kadaikale na, eppadi kadaikum? ", thereby neatly portraying the current scenario, and problems faced by those unable to get a job. From the trailer we see that it is an out and out Dhanush film, with his trademark Rajini style dialogue delivery, catchy punch lines, being the troublesome son to his parents, partying with friends and not to forget the romance with leading lady Amala Paul and his six pack finish! The highlight of the trailer is Dhanush riding an old 'moped' and his neatly combed hair with 'buddi' (professor type glasses), delivering punch dialogues! Undoubtedly the music composed by Anirudh helped in creating hype and started creating waves of followers. Aptly so the background score and the music seem befitting to VIP with a raw and energetic feel. 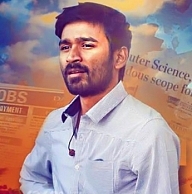 VIP makes a good first impact, with fans in for a wholesome Dhanush entertainer! People looking for online information on D25, Dhanush, Velai Illa Pattadhari, Velai Illa Pattathari, VIP, VIP trailer will find this news story useful.